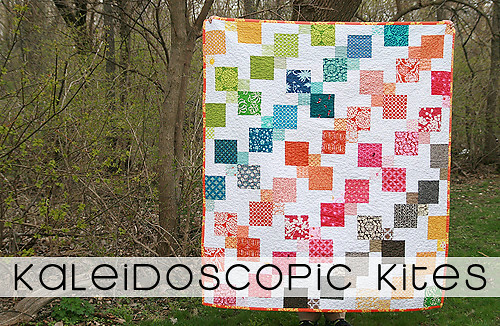 I started a new quilt last night after seeing Faith's beautiful new pattern, Kaleidoscopic Kites. Take a look at hers! I decided to cut into my Katie Jump Rope stash and make my very own! 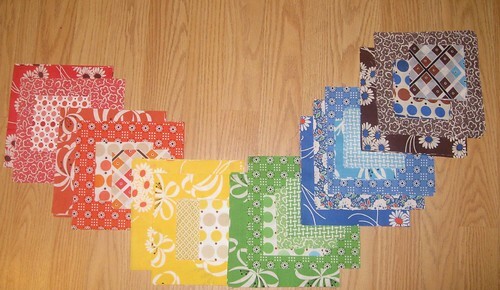 This quilt will be living with me, for a change! I had to use some of Denyse Schmidt's new line for JoAnns to supplement my KJR since I didn't have enough light prints for some colors. They blend nicely I think! Now, on to the giveaway winners! The winner of the Chocolate Lollipop charm pack and notions pins is #39, Live A Colorful Life! The winner of the It's a Hoot charm pack and whimsical pins is #67, Renee! I will contact the winners for their address if I don't hear from them. Winners, please note I am going on vacation for the next week (Las Vegas and Portland!) so I will not be able to mail your prizes until I return. Portland and Vegas? Lucky ducky! I'm loving the quilt too! Hey, yeah. Those two lines work great together! Yay I won! Thank you so much (I just sent you my info). Have fun in Portland. I would move there in a heartbeat if I could. Ok, I know I left a comment. Maybe I didnt press the button right. Have fun in Vegas!! Will be so nice for you to get away with the hubby. Isn't that a great quilt?? I really love it, too! !